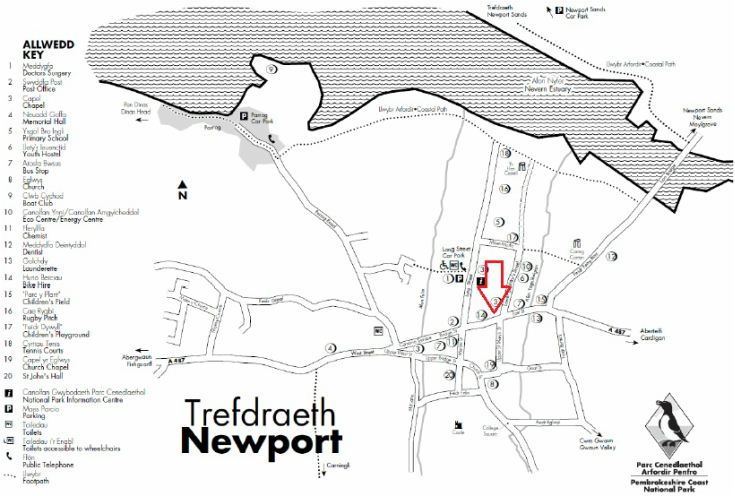 The town of Newport (Trefdraeth) is one of two “Newports” in Wales, the other being a city East of Cardiff. Please do not confuse. Cnapan is in the centre of the small town of Newport on the far West coast between Fishguard and Cardigan. We are on the main road A487, easy to find and car parking is alongside the house. For Sat Nav please use the following postcode SA42 0SY. As a word of warning, Sat Nav can take you through some very minor roads so we recommend following the directions below. Assuming that you will be travelling West along the M4 through to Carmarthen. At Carmarthen follow the A40 towards St Clears, You will pass B&Q on your left at the second roundabout. Travel approximately 19 miles along A40 passing, St Clears and Whitland until you reach a roundabout, where the A478 (Tenby/Cardigan road) crosses A40. Turn right onto the A478 and travel approx 10 miles passing through Clynderwen and Llandisilio until you reach the centre of Crymych ( just by the Crymych Arms ) turn left along Newport Road. Travel along this minor twisty road for about 2 or 3 miles until you come to a T junction on the B4332. Turn left to Eglwyswrw about 1 mile in distance. In Eglwyswrw turn left on the main road A487 and Newport is about 4 miles away. Cnapan is situated about 400 yards into the town on the right hand side just past the Golden Lion pub. If the weather is foggy or icy up in the hills you should follow the A40 all the way to Haverfordwest and then to Fishguard where you would pick up the A487 approaching Newport from the opposite direction. We have a small car park to the side of Cnapan, which can accommodate up to six cars. There is usually enough space to provide parking for all our staying guests. Please park close to the garage as it is not in use, we also suggest reversing into the car park as it can be difficult reversing out on to the main road. If you are walking the coastal path please see the map below of Newport and follow the directions to Cnapan. Upon arrival at the Parrog car park, continue along the path following the estuary towards the Iron bridge. Take the next right (approx 1/2 mile) off the path, up Long Street into Newport. At the cross roads, turn left along the main road and Cnapan is on the right hand side about 100 yards down the road. Walking South from St Dogmaels/Poppit Sands/Moylgrove. Cross the river Nevern over the Iron Bridge and up Feidr Pen Y Bont. At the junction with the main road, turn right. Cnapan is 100 yards up the road just past the Golden Lion pub. The nearest train station is Fishguard and Goodwick, which is approximately 8 miles from Newport. There are 3 trains a day from London arriving at 12.23, 18.46 and 21.52. For up to date train times please see link. ​From Goodwick station (please note not from Fishguard harbour) catch the 410 town service to Fishguard. Connecting bus T5 can be caught from Fishguard square. For full bus timetable please click here. Haverfordwest station offers a fuller service (every hour) but is 22 miles from Newport. Connecting buses (T5 service) which run every hour, can be caught outside the train station. The bus takes approximately 1 hour to get to Newport, but there are no changes. If you are travelling from Ireland, Stenna Line operate two crossing each day into Fishguard from Rosslare. These crossing arrive in Fishguard at 11.15 and 21.25 and depart, 13.10 and 23.45. Taxis can be caught from the ferry terminal to Newport which is 8 miles away. There is a connecting bus service for the 11.15 arrival, the 410 bus goes to Fishguard square, where you can catch the connecting T5 bus to Newport.